Forwards: From top to bottom, the Spokane Chiefs could arguably employ the best core of forwards in the WHL’s Western Conference this season. 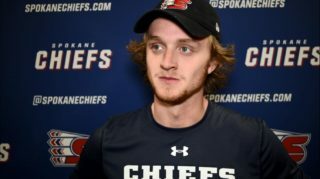 Undoubtedly, the Chiefs will be led by Los Angeles Kings prospect Jaret Anderson-Dolan, who led the team with 40 goals and 91 points last season. The date when he returns from the Kings’ main camp will put the other 21 WHL member Clubs on notice. Another pair of 1999-born forwards in Jake McGrew and Ethan McIndoe will also be counted on for bigger roles as the season progresses. McGrew, a prospect of the San Jose Sharks, balanced out his first season with 38 points (19G-19A) in 65 games while McIndoe added 42 points (21G-21A) in 71 contests. Both players are part of the Chiefs’ strong 19-year-old group and should help power the team into the conversation to capture their first U.S. Division title since the 1999-00 season. Overage forward Riley Woods could lead the charge of the year’s 20-year-olds after surpassing the 20-goal plateau and 50-point benchmark for the first time in his WHL career last season. Of all the players expected to have big seasons, it’s the newest face in Jack Finley that will also have NHL Scouts watching even though he isn’t eligible until the 2020 NHL Draft. A star at the 2017 WHL Cup, the sixth-overall selection comes in at a solid 6-foot-5, 203 pound and is just 16-years-old. How the Kelowna, B.C. product contributes to the Chiefs will be paramount for both parties. Defence: You may have heard of this Ty Smith guy. Well the Chiefs and their fans already know what the Lloydminster product can do and this past summer, they added a new fan base in the New Jersey Devils to cheer on the rear guard. The 17th overall selection from the 2018 NHL Draft finished third on the Chiefs in scoring last season and second among all WHL defencemen. He did this while turning 18-years-old towards the end of the season. Whether Smith spends one or two more seasons with the Chiefs now becomes the debate, but with the departure of captain Tyson Helgesen on the blue line, Smith appears to be the team’s unquestioned leader on the back end. With Anderson-Dolan up front, the two will provide one of the top forward-defence pairings in the entire league. Smith is also pretty smart off the ice too. Beyond Smith, Fiip Kral was also selected at the 2018 NHL Draft, going in the fifth round to the Toronto Maple Leafs and should provide more to the left side of the team’s defence. On the right side, overager Nolan Reid will be counted upon to be a leader as well. Last season, the Chiefs allowed 240 goals. That marked their third-straight season allowing 240 or more goals in a single campaign which isn’t particularly comforting. Yes, they countered that figure by scoring the most goals (282) by a Chiefs team in a single season since the 2010-11 season, but these are all small parts of a reality the Chiefs will no doubt want to address if they want to push deeper than Round One of the WHL Playoffs. Goaltending: The Chiefs will enter the year with a pair of 1999-born Alberta-made net minders looking to win the job in Red Deer’s Dawson Weatherill and Sherwood Park’s Bailey Brkin. At some point, Lambert will be forced into a decision one way or the other, but based on experience, it’d be fair to give Dawson Weatherill the edge, even though Brkin is the older of the two, though just by six days. A 26-win campaign and a pair of shutouts marked a career year for Weatherill, who also set new personal bests in save percentage (0.893) and goals-against average (3.09). Now, to be considered among the WHL’s elite goaltenders, those last two stats will obviously need some improvement, but they kept the Chiefs within contention throughout the year that any further improvement to those numbers will make the Chiefs a tougher team to beat. 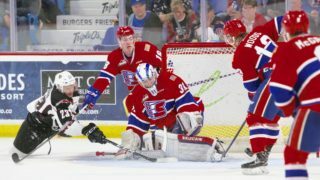 After both Weatherill and Brkin each had an opportunity to prove themselves in net during the 2018 WHL Playoffs, it was Weatherill who helped the team dig out of a 3-1 deficit to force Game Seven against the Portland Winterhawks, stopping 110 of 119 shots in the final three games of the series. That being said, Brkin showed strongly in seven games of action with the Chiefs last season following a deal with the Kootenay ICE. If he’s ready and able to take on a bigger role this coming season, Brkin could be a solid option for the team. Prognosis: Seattle, Everett, and *drumroll please* Spokane? 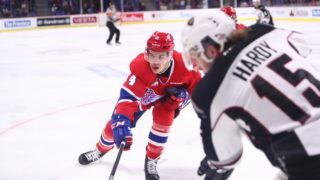 The past four seasons has seen the U.S. Division represent the Western Conference in the Rogers WHL Championship Series and an early indication from the team’s make up is that they could be the team to make it four in a row. The Chiefs possess one of the best forward cores entering the 2018-19 WHL Regular Season and even though their defensive core may lack another game-changer outside of Smith, Kral and Reid, that should be enough to get them into the 2018 WHL Playoffs. As much as the window for the Chiefs is open with departures from other teams in their division and conference, it won’t be a cakewalk either. As the 2018-19 Western Hockey League’s regular season approaches, each division will be previewed leading up to the first day of the regular season Friday Sept. 21. Team capsules are presented in order of 2017-18 finish within their own division. Today, we take a look at the U.S. Division. Forwards: For the first time in the past five seasons, the Silvertips won’t have the reliable duo of Matt Fonteyne and Patrick Bajkov leading their attack up front, but that doesn’t mean their future is bleak. After leading the team with 38 goals last season and hearing his name called by the Minnesota Wild at the 2018 NHL Draft, Connor Dewar was named captain of the team and figures to lead them into the club’s next generation. The same goes for Riley Sutter, who surpassed the 50-point mark for the first time in his WHL career last season, hearing his name called at the NHL Draft by the Washington Capitals. This coming season should see the next in the line of the Sutter family continue his development while causing headaches for his opponents in the U.S. Division and Western Conference. A breakout year for Bryce Kindopp saw the Lloydminster, Alta. product record 36 points (24G-12A) to provide serious secondary scoring, a trait that will need to continue into this season. The one side-effect to last year’s talented roster was that other players didn’t get the chance to show their true form. That’s true for import Martin Fasko-Rudas, who finished the regular season with 15 points (6G-9A) in 70 games, but added an impressive eight points (5G-3A) in 20 games. Seeing what he could do in an increased role this season could be another big boon to the Silvertips. Defence: The departures from the Silvertips continued on their blue line as long-time defenceman Kevin Davis concluded his 347-game WHL career with the Silvertips. In order to partially fill the void left by him on the right side, the Silvertips acquired Sahvan Khaira. A steady hand the Silvertips saw clearly during the WHL Championship, Sahvan is the younger brother of Edmonton Oilers forward Jujhar, a Silvertips alumni himself. The team will also continue to look towards homegrown product Wyatte Wylie to lead them from the blue line. After being made a selection of the Philadelphia Flyers at last June’s NHL Draft, Wylie is set to inherit the leadership role on the team’s blueline for the next few seasons. On the rise for the team is 2017 first round selection Ronan Seeley. After playing at a point-per-game pace with the Lethbridge AAA Hurricanes in the Alberta Midget AAA Hockey League last season, Seeley could find himself gradually taking on a sizable role with the club as he steps up to the WHL game. Goaltending: While the Silvertips will miss parts of their forward core and blue line, it goes without saying that the biggest absence for the Silvertips will come between the pipes. Carter Hart is eligible to return for another season, but after posting video-game like numbers last season for the Silvertips, the three-time Del Wilson Memorial Trophy winner and two-time Vaughn CHL Goaltender of the Year he appears more than ready for the challenges of professional hockey. The goaltending situation is still promising despite Hart’s departure as the reins between the crease now shift to Dustin Wolf. After rotating through a few goaltenders at the start of the season, the team found a quality backup in Wolf, who posted a 13-6-0-0 record, 2.25 goals-against-average, and a 0.928 save percentage along with four shutouts in 20 games against serious competition. 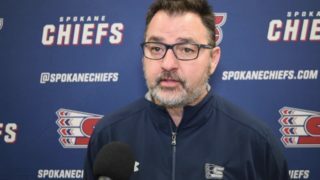 The one question that remains is seeing how he handles the rigors of a full 68-game schedule, but him being up to the task could keep the Silvertips as a conference contender. Prognosis: It’s inevitable that all teams who make their way to the Rogers WHL Championship Series will turnover a significant portion of their roster the following year and the same is true for the Silvertips. However, the Silvertips will still have plenty of talent to help them contend in their bid repeat as U.S. Division champions and will have no problem challenging for a playoff spot if those key pieces remain healthy. Forwards: It’s been roughly 14 months since the Vegas Golden Knights made Cody “Confirmed Good at the Hockey” Glass the franchise’s first-ever draft choice. 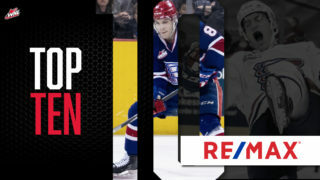 Since then, he’s continued to show the team’s brass and WHL fans just how talented he is, posting his second-straight 30-goal season and the first 100-point campaign of his WHL career. The 2018-19 WHL Regular Season provides Glass with another 68 games plus playoffs to continue punishing opposing defences throughout the league. If he can replicate performances like November 2017 where he tallied 26 points (13G-13A) in just 12 games throughout the entirety of the season, there’s a good chance Glass could contend and lead the league scoring race. While both McKenzie and Bellows are eligible to return, their path in the 2018-19 season may understandably lead them to the professional game, opening the door for the likes of Ryan Hughes and Seth Jarvis among others. Overshadowed in a star-studded lineup was Hughes, who tallied 13 even-strength goals as part of a 41-point campaign last season. The recently-turned 19-year-old will see his role and responsibilities rise more this season. While Glass remains the established leader, another Winnipeg, Man. product is set to make noise on the WHL scene as well with the expected full-time debut of Seth Jarvis. The 11th overall selection from the 2017 WHL Bantam Draft had an 11-game audition with the Winterhawks last season, picking up a pair of assists. The challenge of the WHL was necessary for the 16-year-old after he averaged nearly two points per game with his hometown Rink Hockey Academy in the Canadian Sport School Hockey League. Defence: Last season, the Winterhawks allowed the third-fewest goals in the entire WHL, finishing only behind the two teams competing for the Ed Chynoweth Cup. With aspirations to return to the winner’s circle themselves for the first time since 2013, repeating that feat or maintaining a similar standard of a stingy defence will be key. Unfortunately, the biggest questions for the Winterhawks undoubtedly come on their blue line. After 344 games of service, Keoni Texeira has graduated and the uncertain status of both Henri Jokiharju and Dennis Cholowski leave a lot of questions best left answered through seeing how Johnston uses his rear guards. Brendan De Jong could be the team’s top defenceman with Matthew Quigley stepping into a bigger role as well. John Ludvig and Clay Hanus will also be counted on to contribute after making their WHL debuts last season and playing significant time. Goaltending: When he’s not too busy pulling off an impressive Salt Bae impersonation, 19-year-old Shane Farkas is also pretty good when he gets peppered with pucks. The Penticton, B.C. product is set to handle the starting role for this season. In 24 games last season, he full-time action in short bursts, but wasn’t completely sheltered behind Cole Kehler either. On four occasions last season, he was required to stop 35-plus shots, winning three of those games. That included his second career WHL shutout, a 37-save blanking of the Tri-City Americans in Kennewick in late February. A week later in the same location, he stopped all 30 shots to deny the Americans for the full game. Not that goaltending numbers mean everything, but a 14-6-0-1 record, 2.79 goals-against-average, and a 0.913 save-percentage are solid numbers and Farkas seemed to show more confidence between the pipes, filling in with apt performances when required. Prognosis: With nine straight seasons of more than 30 wins, eight of which reached 40 or more, the Winterhawks have been the toast of the U.S. Division. At the same time, they’ve won the division just three times in those nine years and are yearning for more banners to call their own. While the team has loftier goals than just winning the U.S. Division, the Winterhawks will be a team to watch out for all season long and likely well into the 2019 WHL Playoffs. Forwards: With their top two scoring forwards in Morgan Geekie and Jordan Topping departing from the club for professional hockey, the responsibilities continue to captain Michael Rasmussen, assistant Nolan Yaremko, and second-year winger Isaac Johnson. Rasmussen’s return seems likely, though the timeline is anyone’s guess. In the meantime, Yaremko’s 56-point campaign more than doubled his point total in one season. For Johnson’s debut season in the WHL, he didn’t look out of place either, notching 48 points (17G-31A) in 68 games. Anaheim Ducks prospect Kyle Olson is coming off a season where he was only able to appear in half the games as the season before. Eager to regain his scoring touch, expect Olson to be a man on a mission this coming season. The biggest storyline to watch this season comes in the form of Sasha Mutala. Eligible for the 2019 NHL Draft and a highly-touted prospect, Mutala has represented Canada twice in the past 12 months, winning gold at the Hlinka Gretzky Cup, but has looked best in the red, white, and blue. A 26-point rookie campaign didn’t place him among the league’s best rookies in terms of statistics, but as he steps into a bigger role this coming season and is relied upon more, you can bet Mutala will continue to rise to the challenge. Parker AuCoin saw his production dip slightly for the 2016-17 season to 2017-18, but remained a consistent scoring threat for the Americans and will be looked to once again. Defence: Though they’re all eligible to return, the departures of Juuso Valimaki to the Calgary Flames, Dylan Coghlan to the Vegas Golden Knights, and Jake Bean to the Carolina Hurricanes seem incredibly likely at this point, a huge loss, but not necessarily an unexpected one. In this case, the Americans will look to a defence-by-committee approach with the likes of Roman Kalinichenko, Anthony Bishop, and Dan Gatenby among others. Minnesota product Tyler Jette could find himself in a full-time role to help ease the team’s defensive needs as well, but that begins to throw the team’s overage situation into a bit of disarray. Other defensive contributors like Mitchell Brown will look to continue growing as they spend another year in the WHL, learning to play the game at a high level. It’s difficult then to predict how this will impact their chances this season. In such a tight division, offence can take you far as the other clubs have shown, but it’s defensive responsibilities that end up winning the day. Goaltending: After goaltender Patrick Dea aged out, it appears the Americans are set to go with the tandem of Beck Warm and Tayln Boyko in net this season. This is a duo that can stay intact for two full seasons, providing a great deal of stability to the team’s crease. While Dea started more games than Warm last season, a 47-35 split for games played is still relatively even by WHL standards. Warm’s 16-11-1-1 record, 3.58 goals-against-average, 0.889 save percentage, and one shutout were pretty standard for a goaltender who has yet to play in 50 WHL regular season games. The pressure this season comes with the step back the team’s blue line will take and figuring out if he can handle the extra workload. Joining him will be Talyn Boyko. The Drumheller, Alta. product was a third round selection of the team at the 2017 WHL Bantam Draft and has seen three pre-season games of action to date, posting relatively expected numbers for a 15-year-old who doesn’t turn 16 until mid-November. His crowning moment during the pre-season came when he stopped 45 of 48 shots against the defending Western Conference Champion Everett Silvertips to to secure a 4-3 shootout win. Having him at the top of his game, even in a limited role, could be strategically beneficial for the Americans. Prognosis: In a division where competition is fierce, the Tri-City Americans know that all too well. With key injuries throughout last season, many wrote them off, even as they qualified for the 2018 WHL Playoffs. 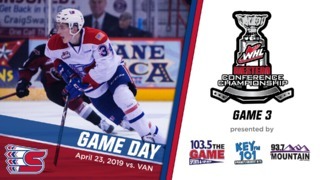 Then came two straight four-game sweeps and a dogfight of a six-game series against the Everett Silvertips in the Western Conference Championship. With incoming head coach Kelly Buchberger, there’s bound to be a transition period where the team gets used to the coach and vice-versa, but the former Moose Jaw Warriors forward knows the league and is no doubt determined to have immediate success. There’s no way to look past the departures on defence, but it isn’t all doom and gloom. Besides the losses of Geekie and Topping, the Americans can boast a healthy array of talent up front that should keep the team competitive for a spot in the 2019 WHL Playoffs. Forwards: The ago-old adage about developing from within is perhaps best exhibited by the Seattle Thunderbirds and their group of forwards. With names like Barzal, Easnor, and Kolesar making good on that statement in recent years, those responsibilities have now fallen onto the shoulders of those named Volcan, Andrusiak, and Wedman among others. Returning two 30-goal-plus scorers in Volcan and Andrusiak is a big boost for the club, who will depend on the duo for steady offence after learning the ropes of those duties last season. Secondary scoring from the likes of Noah Philp and Matthew Wedman will also be counted upon as the team looks to replace three of the players who surpassed the 20-goal plateau for them last season. After a six-game audition last season, Payton Mount will be looking to impress in his rookie campaign. The 19th overall selection from the 2017 WHL Bantam Draft was a point-per-game player while helping his home province of British Columbia win gold at the 2017 WHL Cup. The Thunderbirds will appreciate watching his talents grow over the coming season and beyond as will scouts ahead of the 2020 NHL Draft. Import forward Andrej Kukuca has already made an impact with the club, leading them with nine points (4G-5A) in pre-season play. Defence: This year’s blue line will be led by a pair of 1999-born talents in Jarret Tyszka and Reece Harsch. The Montreal Canadiens prospect Tyszka showed promising development last season and should figure to take another step forward this season as the Thunderbirds look to climb back up the standings in the U.S. Division. Harsch has attracted interest from NHL clubs, attending camp with the Vegas Golden Knights and the right mix of opportunity and talent have Harsch poised for a career year that could very well put him on the radar for the 2019 NHL Draft. The T-Birds will also look to the likes of 2016 first round WHL Bantam Draft selection Jake Lee to take a step forward, especially in his first year of eligibility for the NHL Draft. Goaltending: The 2017-18 year was one of transition in net for the Thunderbirds, one they’ve appeared to stabilize for at least the next two seasons with Liam Hughes. In the 2017-18 campaign, Hughes was an early-season addition to the T-Birds and posted a respectable 16-12-5-1 record with a 3.15 goals-against-average and a 0.909 save percentage in 36 games. The thing about last year though is that there were times where Matt Berlin and Dorrin Luding picked up the slack. Now, the T-Birds appear to have full confidence in Hughes and for good reason, but where the team may be challenged is in the use of their backup as Hughes will inevitably need time off. Right now, that backup position lies with either Cole Schwebius and Eric Ward, a pair of 2001-born talents who have put up fairly good numbers in their limited pre-season action. While both are young, the decision will play a big part in terms of the team’s success every night and not just when one goaltender is in net. Prognosis: Now a full season removed from their Ed Chynoweth Cup victory, the Seattle Thunderbirds have already turned over the majority of their key players from that championship victory, but remain strong at all three positions. The question looming for the T-Birds is how big the gap this year is between great and elite. The Thunderbirds should have no problem filling the net and returning to the WHL Playoffs, but with other clubs looking to take a better shot, the Thunderbirds may need to find another gear in their play in order to challenge those at the top.